Operates as a smart IP camera. The application supports capturing silent camera pictures/recordings without anyone knowing! Utilize your phone as a Skype portable webcam. MJPEG stream supported by most video chat services. Real time video streaming over WiFi and 3G networks. Either connect to the device over WiFi and use VLC to view content or use the free streaming server (included as a download from CloudCam) to stream real time camera video from the device over 3G. No third party included! 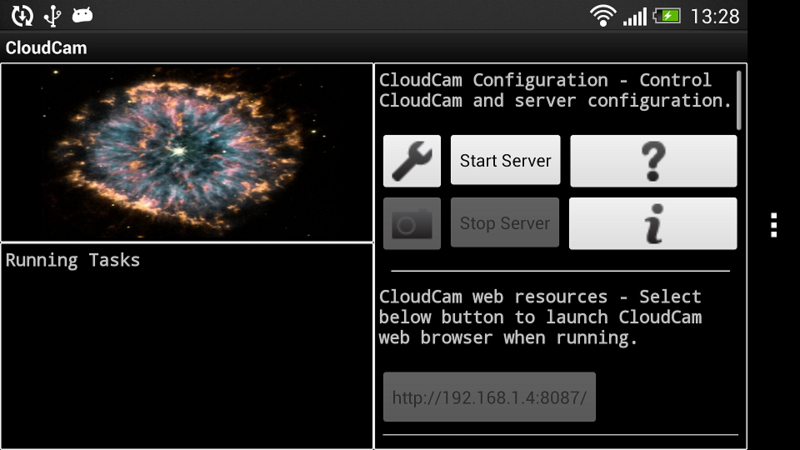 Capture scheduled camera images/recordings and upload to the Cloud or save to SD card. Configure application to capture and send camera images to email, Picasa, Dropbox, or FTP. G-Sensor/Picture motion detection. Automatically activate camera snapshot mode,video streaming mode or video/audio recording. Scheduler supports multiple timers to control CloudCam features. Notify using email when the battery status on the device changes. If the device is plugged into the mains, the device can detect a power failure from the mains and automatically email to notify. Secure remote control from anywhere in the world. 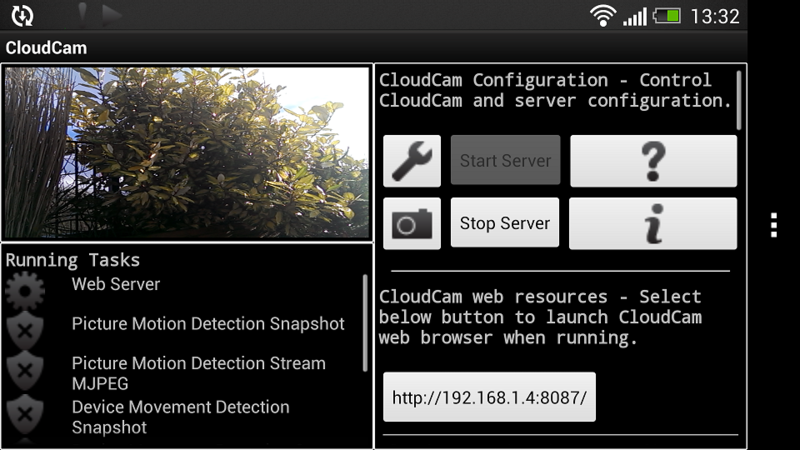 The application can be controlled remotely using email to switch ON/OFF CloudCam features and change camera settings (i.e. zoom, turn camera flash light ON/OFF, adjust picture quality,switch ON Snapshot/Video mode and many more). Advanced performance settings to cater for long surveillance operations and limited power. Switch CloudCam into sleep mode to save battery power and reactivate remotely or through configured timers. Free streaming server supports automatic presentation of real time streaming video content from the handset to waiting streaming players like VLC. Multiple streaming servers can run in parallel on a PC,Mac or Linux server servicing multiple CloudCam device allowing multiple CloudCam devices can be viewed from a single source. 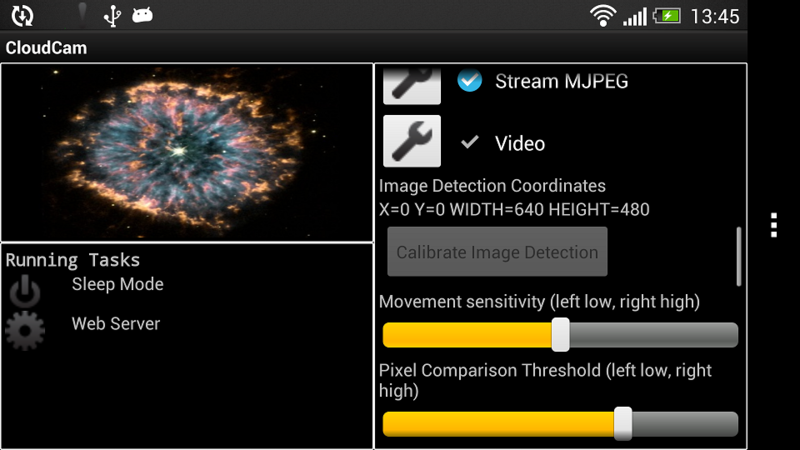 View MJPEG content from the camera over WiFi/3G networks using the free Android MJPEG viewer CamBuddy. Please note the CloudCam application can also transform your Android WiFi tablet into an advanced remote controlled wireless camera. 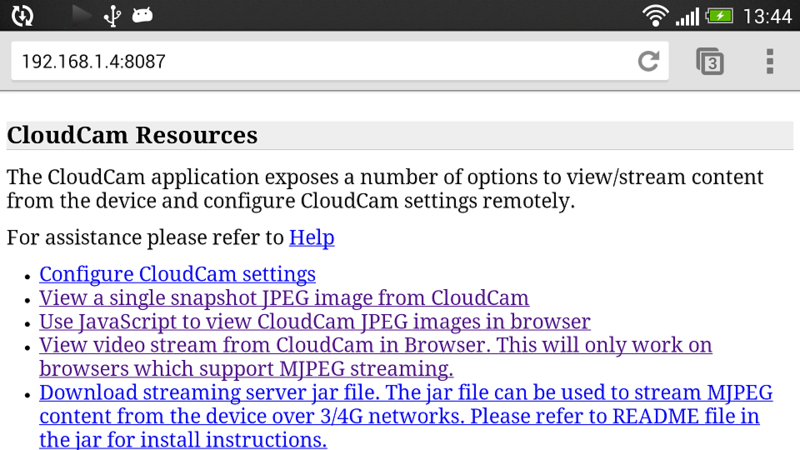 The following images provide an overview of the CloudCam application running on an Android device. Main application screen with server not running. Main application screen showing server running. Main application screen showing server running in sleep mode.